Cook the noodles in a large pan of boiling water for 4–5 minutes and drain. Heat the oil in a wok or large non-stick frying pan and fry the garlic and ginger for a minute until light brown. Add the onion and pepper and cook for a further 2 minutes until almost tender then add the bacon and prawns and stir-fry over a high heat for 3–4 minutes until just cooked through. Stir in the curry powder and cook for a minute. 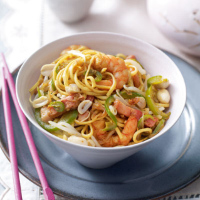 Add the beansprouts, cook for 2–3 minutes then add the cooked noodles and soya sauce and toss everything together. Add the peanuts and cook, stirring for 1 minute until hot. Serve immediately in warmed bowls. For extra convenience, use straight-to-wok noodles. If you’re aiming for a healthy meal with a glass of wine, try this brilliant white that’s 7.5% alcohol and has a hint of sweetness to complement the spice: Dr Loosen Ürziger Würzgarten Riesling Kabinett, Mosel Germany.